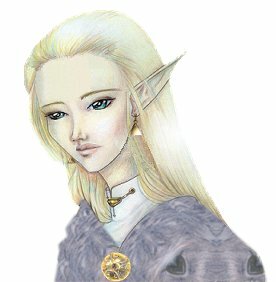 Annalise is a young elven girl. Though she's had a rough start to her young life, it never stops her laughter from ringing through the firehall. Her blonde hair, bright blue eyes and contageous smile can often be seen amoung the citizens enjoying the company of others in Camelot's great hall. She is the child of Lughar and Christalin, though due to several twists and turns has come to reside with Seraine and Zellan. Being raised by humans, she is constantly craving knowledge of her birthright, ever awed by the beauty she finds.